Who's baby food diet is it? Escaping the bad rap creating a fad diet comes with most celebrity trainers are not willing to take ownership. Will you? Baby diet review. The baby food diet!? - That sounds like such a horrible way to lose weight. However, since the spread of baby talk through Tinseltown (rumors too important to stay locked away behind barricades of glass separating celebrity weight loss from the outside world) everyone has been talking about this diet where you eat baby food to lose weight despite the fact that for adults it is much like eating pulp. The baby food diet plan was conceived by Tracy Anderson, celebrity-celebrity trainer of the stars who is also creator of metamorphosis also known as the Tracy Anderson Method tried and tested by Kelly Ripa, Gwyneth Paltrow, and anyone who is anyone in Hollywood. It all started with rumors of Jennifer Aniston eating baby food for weight loss to fit into a picture. The baby food diet is an interpreted diet. That means it is just, how you would say… babalooza out of control. Everyone including the city of Jackson knows what it is but can't decide on which is the best baby food cleanse diet. Tracy Anderson Baby Food Diet. Jennifer Aniston Baby Food Diet. Who baby is it, anyway? Although Jennifer Aniston denies rumors that it is hers and Tracy Anderson is not picking up the phone, you would be amaze how many people have picked up the baby food diet for weight loss. If you've ever looked into baby food diet reviews, you know there are as many variations as there are flavors of baby food. Due to the face that the baby food diet is an interpreted diet, there are many variations of the baby food diet. However, each variation is a derivative of the following methods. Generally speaking most baby food diets that fall within this category prescribe replacing breakfast and lunch with 14 jars of baby food followed by a hearty dinner. Conservative baby foods diets only recommended, replacing one meal preferably breakfast as seen in other morning diets such as the morning banana diet. Extreme cases of the baby food diet include the replacement of all foods with food that is meant to be eaten by babies. Snacking is a diet methodology that helps you pick up the scraps you need to make it between meals without destroying your diet. For people having trouble keeping hunger under control, snacking between meals is a fresh choice that will take you far. Eating a jar of baby food may be the quick pick me low-calorie snack you need to keep your composer between meals. Rumor has it that practitioners of the baby food diet are breaking new ground in weight loss not to mention saving money. Buying baby food is expensive. Breastfeeding mothers save between 500 and 3k dollars a year not buying baby food. Imagine how much money it would cost to feed an adult on baby food. A cruise to the Buhamas. Buy a new computer. In short, that's one financial burden you don't want to undertake. Learning how to make purees from carrots, meats, and mashed bananas can save you a lot of money when on a baby food diet. 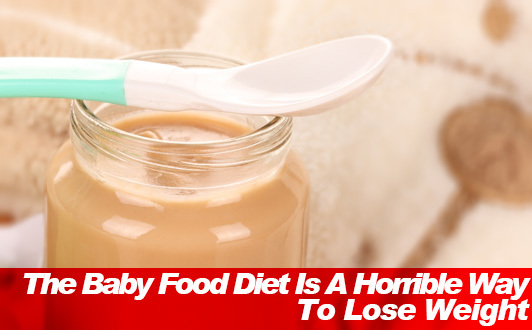 Eating baby food to lose weight… that's just bad! Maybe the baby food diet isn't the most horrible but it is definitely on the list. This abandoned diet ranks with the best of them. Tapeworms. Imaginary food. Cabbage soup (which is not half bad). Either way you look at it there is something wrong with adults eating baby food. What's next a cat food diet? - It just goes to show how far people will go to get slim. Adults and babies have very different dietary needs in terms of nutrition. Eating baby food may be enough for babies; however for adults it's an accident waiting to happen. 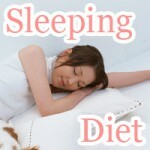 In some special cases, there have been reports of people going on the baby food diet overeating and not losing weight. Something tells me that eating 14 jars of baby food is not enough. As you might have guess, eating 14 jars of baby food a day is going to get old fast despite how many different flavors of baby food there are. There may be a lot of baby food available but after you are done trying the best of the best in taste that even adults can't resist sneaking in a spoon when no one is looking such as peaches and mangos, eventually you make it unexplored baby food flavor horror. When you running out of option and the only thing you have left to eat are squash, chicken, vegetables & stars, or turkey broth, you may soon realize that you miss eating the real thing. If it's so horrible, why do people love it? In spite of the fact that the rumors that celebrities eating baby food may not actually be true, from day one you and many other like you (diet enthusiasts) get it. There is no one all-encompassing way to lose weight. Why not eat baby food? Babies eat it. That means it must be safe… right? Does lose weight without exercise sound familiar? The baby diet is just that. Sugar, spice, and everything nice. People love it! One reason why people turn towards a diet eating baby food is that it becomes easier to give up on cooking. What a better way to lose weight, cutting the time you spend preparing healthy meals by a third. Just imagine the amount of extra time you would have spending only minutes a day cooking. In addition to helping you reduce calories in your diet, the baby food diet promises to help you detox. That means cleansing your body getting rid of body toxins. In an age of GMO foods, people grow more and more conscious about what they put in their bodies. For example, baby food doesn't come with artificial food additives and pesticides. Ideally, that would be nice to here. However, it is only the organic brands are free from this ongoing swapping of ingredients designed to put the most affordable food on the shelf. Regular brands are known to contain coloring and preservatives as additives. The baby food diet is undeniably a fad diet. Even so, that doesn't mean that there aren't things you can learn from it. For instance, replacing meals to reduce calories, snacking more healthy and improvising to make diets work better for you are 3 concepts you can apply to any diet as a matter of fact. As with any diet to lose weight there are limits on how for you can push your diet on unorthodox weight loss. That means accepting the fact that diets like the baby food diet or quite not cut out for the long term. However if you must try out the baby food diet, there is an endless supply of interpretations, reviews, and gossip regarding the baby food diet that will never quite. Lose weight by only eating tomatoes with the tomato diet. Whether you like it or not your body needs antioxidants to keep you looking young. So exercise the laws of attraction and tear it up with to with Tomato lycopene and activation DNA to enter a new age in your weight loss.